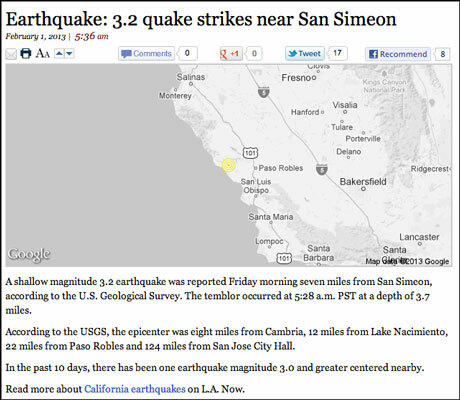 When a 3.2-magnitude earthquake struck in California at 5.28am on 1 February, the Los Angeles Times reported the news. The story was published at 5.36am, just eight minutes later, complete with a map showing the epicentre of the quake. The post carries Ken Schwencke's byline, who may well have been asleep when he wrote and published the story. Schwencke in fact wrote the code that auto-wrote and auto-published the story using information from the US Geological Survey (USGS). "Ken wrote the algorithm that sits on top of earthquake notifications," Schwencke's colleague Ben Welsh, a database producer at the Los Angeles Times, told Journalism.co.uk. "The structured data comes in and Ken has an algorithm that says if the earthquake is close to California and over a certain magnitude it is 'news'. "That automatically writes a blog post that looks like it was written by a human – well it was written by a human, by Ken – and it instantly creates a map, blog post, headline, and automatically posts it into our blogging platform." Welsh calls this "human-assisted reporting", which was the title of a presentation he gave at last year's computer-assisted reporting conference NICAR. There is a video of the talk in which he explains how to set up an automated data pull from an updating dataset. "Algorithms can help you find and report the news," Welsh says. "You can write code that will ask and answer the common questions that a reporter would ask when looking at that same dataset." In the case of an earthquake, the reporter's questions might be: When did it happen? Where did it strike? What magnitude was it? What depth? The computer, instead of the human, then takes that information and turns it into a text story. Another source of data Los Angeles Times reporters receive is a daily email with a csv attachment detailing the arrests made by the famous LAPD the previous day. A question the human reporter might ask when looking the data is 'who has committed the most serious offence?' To do this he or she might look at the highest bail amount posted. The journalist might also comb through the list of occupations, looking more closely at a minister, mayor or actor. The robot reporter does exactly the same, and then emails the crime reporter, flagging up the story. The LA Times was able to scoop the competition when a reality TV star was arrested, Welsh explains in the presentation. The LA Times is by no means unique in using computers to assist reporters. The Chicago Tribune uses PANDA, a Knight-funded project that enables any newsroom to set up a data library, to send alerts to reporters based on data from arrest warrants. 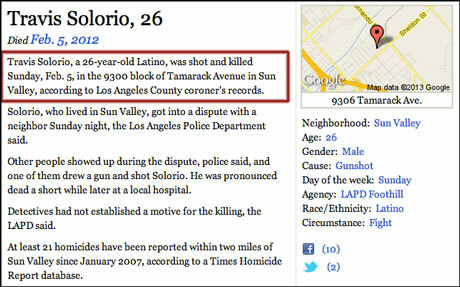 Another example of report reporting at the LA Times is the Homicide Report. "We try to track every homicide that happens in Los Angeles county, have a post for every person," Welsh explains in the presentation. "We don't have enough resources to do a lot of reporting on all of that but a certain amount of information based on the coroner's data can be automated." The Los Angeles County coroner's office releases a list of deaths it determines to be homicides. While journalists at competing publications are copying and pasting, robots have already written the first sentence and published it on the Homicide Report blog. "Part of that is automated and part of that is human," Welsh told Journalism.co.uk, with a real reporter then expanding on the first line. 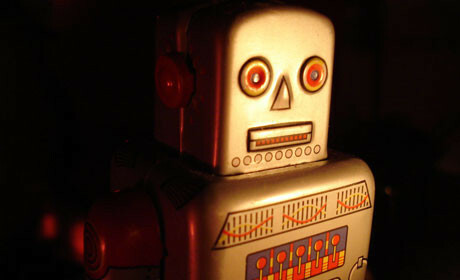 The Los Angeles Times is not the only news outlet to publish stories written by robots. Forbes.com carries stories with the curious byline of Narrative Science. A research project that started by automatically generating baseball game recaps has developed more than a decade of research into a company called Narrative Science, with robot reporters writing forecasts for Forbes.com. Emily Bell wrote about the Narrative Science and Forbes partnership on the Guardian's Media Blog last year, and asks whether robot reporting is "an apocalypse for the news industry". Bell describes how Narrative Science "turns data into stories of a type which will not be winning many Pulitzers". Kristian Hammond from Narrative Science disagrees. He told the New York Times in 2011, six months before Bell's feature: "In five years a computer programme will win a Pulitzer Prize – and I’ll be damned if it's not our technology." In his NICAR presentation, Welsh from the LA Times reminds Hammond that computers have been assisting in reporting for years. "I hate to break it to him but computers have already won the Pulitzer Prize. A half dozen of them, starting in 1989." Welsh adds: "What we should really strive for is not to automate for automation's sake or to save money, but what would really be great is if we could make it easier and lower the barrier to do the kind of work that wins the Pulitzer Prize."